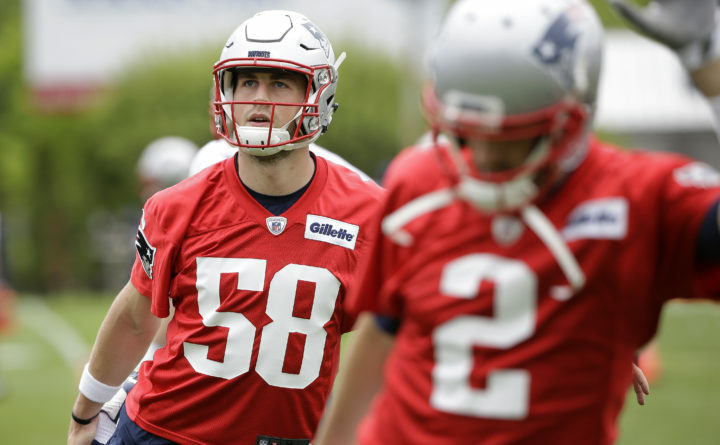 New England Patriots rookie quarterback Danny Etling (58), and quarterback Brian Hoyer (2) warm up on the field during NFL football organized team activities practice at the team's training camp, in Foxborough, Massachusetts, Tuesday, May 22, 2018. FOXBOROUGH, Massachusetts — Seven-on-seven drills. Brady’s dissatisfaction reportedly stems from a below-market contract — two years, $41 million — and talk last season of speeding up the plan for Jimmy Garoppolo to succeed him as the starter. Garoppolo was traded to San Francisco, which gave him a contract that guarantees him more than $60 million in the first two years.